Do you often find yourself out-and-about with your dog without a leash in situations where you really need one? With Rad Dog's Release N Run Collar + Leash, you'll never again have to pass by an opportunity to share an outing with your favorite canine companion due to not having access to a leash. 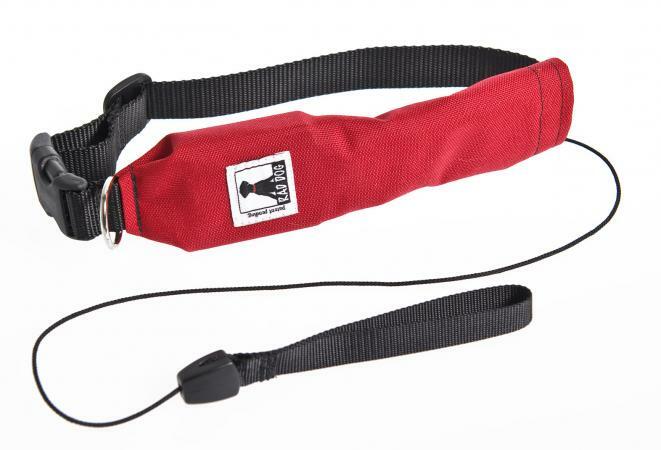 Whether you want to drop in on a dog-friendly diner for a snack or make an unplanned stop at a cool hiking trail, this ingenious dog gear item helps ensure that you'll have quick-and-easy access to a leash at any time. As an outdoors enthusiast who person with her own pack of canine companions (three very well-traveled dogs), I was really excited when the Rad Dog team invited me to review their Release N Run Collar + Leash in One. The concept is super-simple, yet I'd never seen anything quite like it before. Basically, this item just a canvas dog collar with a very functional secret zipped away inside. What's the secret? You guessed it! There's a built-in leash inside. It's a four-foot long retractable leash, so it's perfect for just about any type of adventure you might want to share with your dog. When the leash isn't necessary, it can simply be tucked away inside the leash, then pull out on a moment's notice. To check out this great leash in action, take a look at this action video from Rad Dog Pet Gear's YouTube channel. This leash is ideal for dogs that spend a lot of time off-leash, but could - at any time - end up in a situation where quick access to a leash is a must. It's also ideal for people who like to run or hike with their dogs, as well as those who take their dogs on canoe trips, boating excursions or road trips. For example, I frequently take RV trips and road trips with my three dogs. Of course, we stop for potty breaks, and potty breaks mean leashes. I have spent way too much time scrounging around in the cab of my husband's truck looking for dog leashes while dodging really excited dogs that need to go! With Release N Run, I won't need to do that anymore. I'll simply be able to unzip each dog's collar and pull out her leash. Then, when it's time to get back on the road, once I let go of the leash it will retract back to its resting spot inside the collar What could be easier? Basically, if this item becomes your dog's primary collar, you'll never find yourself scrounging to find a leash whenever the need for one arises. Rated for dogs up to 110 pounds, this retractable dog leash is super-strong yet lightweight. It is available in four sizes based on neck circumference and weight, so it's easy to find the perfect fit for your pooch. It also comes in seven collars, so you can find a shade that looks great on your dog and that is consistent with your overall style preferences. This versatile collar and leash in-one costs just under $40. In my opinion, that's a small price to pay for knowing that you'll never find yourself without quick access to a leash when needed. Note: The author received a no-cost Release N Run product sample in order to complete this review. The opinions presented here are her own.